The model below represents an educational toy. 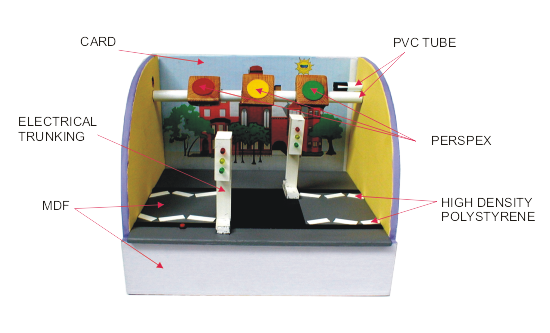 It function is to teach young children how to use a pedestrian crossing. A range of materials have been used including perspex, PVC, MDF, card and various parts such as electrical trunking. Much of the materials used have been found in the scrap bin ensuring minimum waste. This model can be regarded as a prototype. This is a scaled model of a lunch hall. Again the materials have been recycled from the scrap materials bin. A computer controlled router has been used to engrave the shop name ‘Cafeteria’. All aspects of the model work including an electronic circuit that counts customers as they enter and leave the premises. Minor detail has been added including a small noticeboard just inside the rotating door. Patterned lino has been cut to size for the floor for added realism. This is a detailed and well manufactured model. 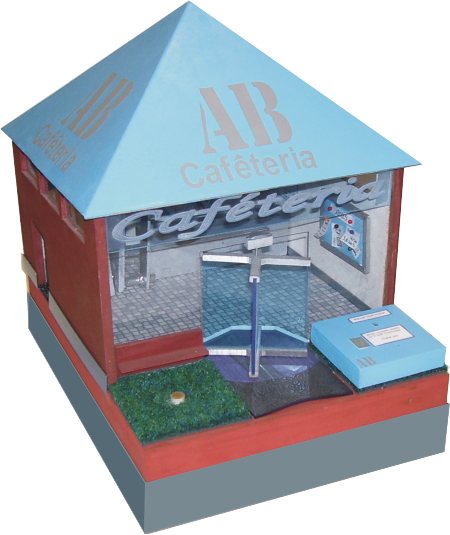 A model of an automatic animal feeder is seen opposite. 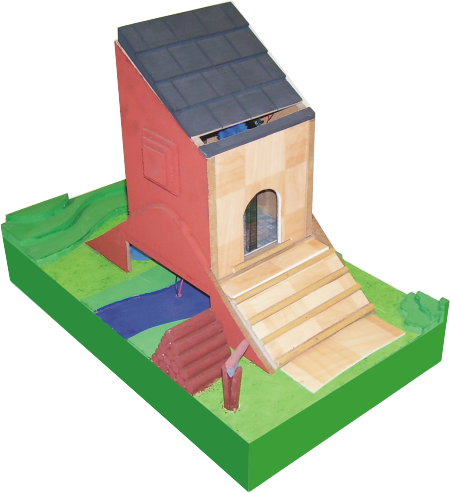 This has been constructed from a range of materials including perspex, MDF, High density polystyrene. The surfaces have been painted with water based emulsion paints for added realism. Small detail has been included such as the slate effect roof and wood effect material glued on to the front of the feeder. The feeder works by automatically opening the door at the front, allowing the ‘hamster’ to feed from a dish just inside the door. A microcontroller circuit opens the door to the feeder twice a day.